KSP apply 'Old School' Printing methods onto 'New School Products. Which is best Old School or New School? At KSP Group we know some very important people who appreciate what we know and want us to apply our ‘Old School’ printing methods onto their ‘New School’ products. Over the years many printing processes have changed and modernised but screen printing has remained pretty much unchanged. Ink is still squeezed through a mesh, even on something as unique as the side sills for a £1.1m super-car. 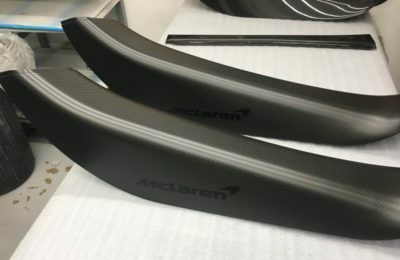 At KSP we developed a way to clamp the odd shaped sills and made a bespoke screen holder to allow us to print the logo onto the raw carbon fibre sill prior to them being lacquered and sent to the manufacturer for assembly. So next time you see one of these beautiful cars have a closer look as every one of them has a little bit of the ‘KSP touch’ on them.